Like its predecessor - the Garmin StreetPilot 2620 - this unit features a high-resolution color touchscreen with voice prompted turn-by-turn navigation and a powerful microprocessor for fast route calculation and map redraw. The system includes a unique wireless infrared remote control, which allows easy operation of the unit from a distance. The Garmin StreetPilot 2620 also offers WAAS-enabled support to ensure the highest degree of GPS accuracy. Garmin StreetPilot 2620 has been discontinued. Accessories, spares and parts are still available for your StreetPilot 2620. The Garmin StreetPilot 2620 is a plug-and-play portable automotive GPS navigator that features MapSource City Navigator pre-loaded, detailed maps - right out of the box. This means no unlocking or uploading map data to your unit! The Garmin StreetPilot 2620 offers a number of new and exclusive software upgrades. Do you want to find the most efficient route for deliveries or sales calls? Users can enter a series of destinations, and the Garmin StreetPilot 2620 will automatically sort them to provide an efficient route. Would you like to avoid traffic tie-ups or roadwork? Users can specify areas and road segments to avoid when calculating routes. The Garmin StrretPilot 2620 is powered using the external speaker with 12-24 volt adapter cable or A/C power adapter (both included in purchase). The Garmin StreetPilot 2620 also offers WAAS-enabled support to ensure the highest degree of GPS accuracy. The unit includes a pre-programmed 2.5Gb hard drive that stores City Navigator detailed maps of the UK and Europe. Motorists can navigate to a specific address or access an industry-leading database of more than five million points of interes - including lodging, restaurants, gas stations, and local attractions. The intuitive, menu-driven touchscreen ensures that navigating the unit is as easy as navigating the road. Looking for accessories and spares for the Garmin StreetPilot 2620 view them all here. 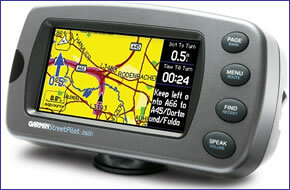 All parts are genuine Garmin product and specifically designed for use with the StreetPilot 2620 sat nav.